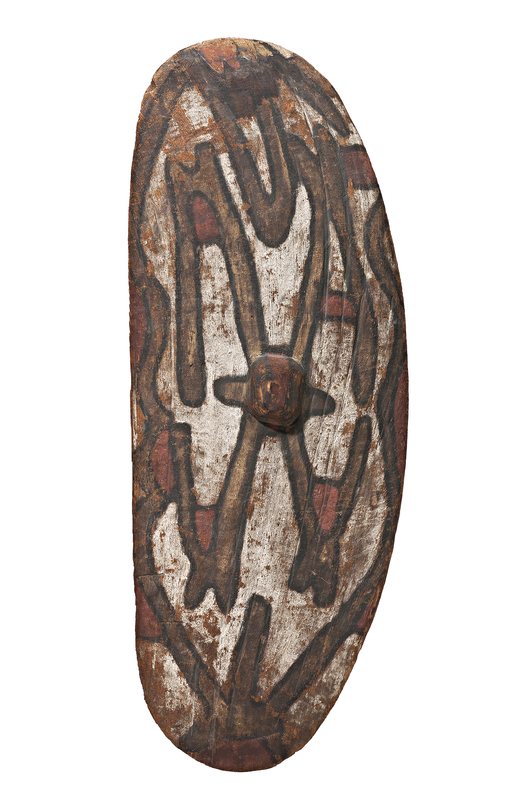 The present distinctive kidney-shaped shields were traditionally made by the Yidinyji clans in the area around Cairns and the hinterland of the Atherton Tablelands on the north-eastern coast of Cape York Peninsula, Queensland. Fashioned from the buttress roots of the native fig tree, the shields feature a central boss for strength with a raised handle on the reverse. As part of a man’s weaponry, such shields may also be accompanied by large, man-sized wooden swords, often painted in similar designs – the shape of the shields, rounded on one side and straight on the other, thus allowing the holder to wield the sword freely. The shields are usually painted in natural pigments and ash by two male elders, simultaneously working from opposite ends in initiation rituals using lawyer can brushes. Designs, such as the one featured on this shield, are quasi-symmetrical and depict a range of totemic flora and fauna; the constellations; atmospheric phenomena like rainbows, and hand-made objects of material culture, including bark water-bags, axe heads and boomerangs. Shields bearing similar designs may be found in the collections of the Queensland Museum, Brisbane; the Australian Museum, Sydney; and the National Gallery of Australia, Canberra.